Wolves lead and dogs follow - but both are equally capable of working with humans, according to research that adds a new twist in the tale of how one was domesticated from the other. Dogs owe their cooperative nature to "the wolf within", the study, of cubs raised alongside people, suggests. Scientific Reports published the study. Grey wolves, at the Wolf Science Center in Vienna, were just as good as dogs at working with their trainers to drag a tray of food towards them by each taking one end of a rope. But, unlike the dogs in the study, they were willing to try their own tactics as well - such as stealing the rope from the trainer. Friederike Range, from the Konrad Lorenz Institute, at Vetmeduni Vienna university, said: "It shows that, while wolves tend to initiate behaviour and take the lead, dogs are more likely to wait and see what the human partner does and follow that behaviour." 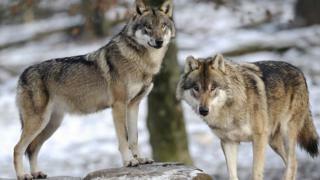 About 30,000 years ago, wolves moved to the edges of human camps to scavenge for leftovers. The subsequent "taming" process of domestication and selective breeding then slowly began to alter their behaviour and genes and they eventually evolved into the dogs that we know today.